Acing your Next Teacher Interview! Discover the Insider Secrets to Acing your Next Teacher Interview! ...learn the inside secrets from an expert in teacher interviews. 25 practice questions that interviewers are sure to ask. With tips on how to answer each question AND actually sample answers! 12 questions YOU may want to ask the interviewer to let them know you're serious about getting this job. The 5 most common methods of applying for a teaching job and the proper etiquette for each. Discover the wrong words to use when writing a cover letter and how to find the right ones. Learn what you must have with you when sitting down with your interviewer. Learn the appropriate way to follow up with an interview. Learn the resume mistakes that make recruiters furious. Learn what must be in your resume if you are to be taken seriously. Learn 17 areas in which your interviewer will be judging you. Learn 3 sets of skills that a potential employer will expect you to have. For a limited time my friend, Jimmy Sweeney, is allowing me to give away the instant-download, (ebook version) of his newest book to our customers as a special gift. 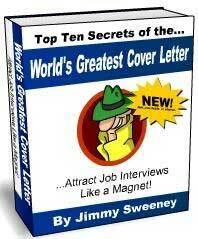 It's called, Top 10 Secrets of the World's Greatest Cover Letter... Attract Job Interviews Like a Magnet. I am SO pleased Jimmy is letting us in on this special give-away. You'll love this one-of-a-kind book, the graphics are really cute and you can read it quickly because of Jimmy's easy-reading, "Top 10" format. However, we will not have this available online for very long.